In the late 19th and early 20th Centuries, artists in Europe and America began discarding the conventions and traditions of the past in search of creating something "new." Personal expression and individualism were embraced as artists forged new visual vocabularies in search of being "original" and modern. American Modernists explores the stylistic developments and diverse approaches to the image-making process as American artists undertook to create new art during the 20th Century. 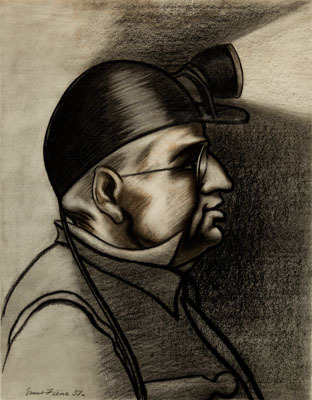 Left: Ernest Fiene (American, 1894-1965), The Mine Superintendent, 1937, drawing, mixed media, 18" x 14", gift of Mr. Richard Plotka, University of Wyoming Art Museum Collection, 1977.86. 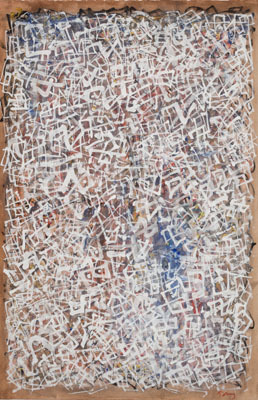 Center: Mark Tobey (American, 1901-1973), Confusion, 1962, tempera, 27 7/8 x 14 inches, gift of Mr. William Dean, University of Wyoming Art Museum Collection, 1991.26. 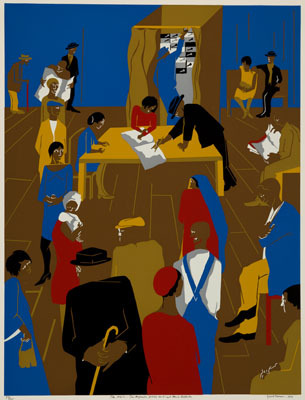 Right: Jacob Lawrence (American, 1881-1940), The 1920's...The Migrants Cast Their Ballots, 1974, color serigraph, 32" x 24 7/8", University of Wyoming Art Museum Collection, 1976.58.